A new, mobile low level laser therapy (LLLT) product has arrived at Accents Cosmetic Surgery to help men and women prevent the progression of hair loss. 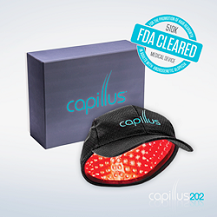 Called the Capillus272 Pro™, this wearable laser therapy product is designed to increase the flow of blood and natural growth factors directly to hair follicles, helping patients who suffer with androgenetic alopecia develop a thicker and fuller head of hair. Capillus272 Pro™ is cleared by the FDA for the treatment of androgenetic alopecia, or hair loss, in men and women. The laser cap has been shown to promote up to 51% increase in hair count, according to independently reviewed clinical studies available online at ClinicalTrials.gov. Compared to other low level laser therapy options, Capillus272 Pro™ offers patients a high degree of discretion and convenience. The laser insert is placed beneath the cap of an ordinary hat or head covering, allowing patients to enjoy treatment without the worry of prying eyes. Capillus272 Pro™ is battery-operated and comes with a complimentary carrying case, allowing for consistent use around the house, at the office, and even on vacation. In addition to low level laser therapy with Capillus272 Pro™, Dr. Berkowitz offers a variety of surgical and non-surgical hair restoration options for men and women who suffer with hair loss. Dr. Berkowitz specializes in the NeoGraft hair transplant procedure, having performed hundreds of procedures totaling over 1.4 million grafts in the Michigan area. For more information on hair restoration with Capillus272 Pro™, visit http://www.accentscosmeticsurgery.com.